Yesterday, in my first part of a two part series I broke down the worst picks of the Andy Reid era. Today, I am going to look at the best draft picks in each round of the draft. There will be one player that falls into the "Gold Standard," which is the best pick of that particular round and the "Silver Medal," for the second place finisher. As I looked over the players that Reid has taken over the years, it became clearly obvious that the Eagles do their best work in rounds three through five. The first round of the draft has seen many misses, but not as much as the second round has brought the Eagles. However, when the Eagles get to the middle rounds of the draft, they have struck gold. They found extremely talented and Pro Bowl caliber players. Hopefully in nine days, Reid can continue his successful track record and improve his second and first round selection skills. The only other Eagle players that could fit into this slot were Lito Sheppard or Shawn Andrews. Andrews was well on his way to becoming one of the best offensive linemen in the NFL until depression and back problems ruined his career. As for Shepppard, he was a good cornerback for the Eagles in his tenure with the team, but has flamed out since leaving the squad. My pick is for the wide receiver out of Missouri. While Maclin has only played one season with the Eagles, he has shown that he is on his way to becoming a great wide receiver in this league. In his rookie year, he registered 55 receptions for 762 yards and four touchdowns. Maclin may never touch McNabb status, but he could become a star. This was almost the pick that wasn’t. Just two picks earlier, the Eagles took defensive end and current bust defensive tackle Trevor Laws. At the time, Eagles fans were screaming their heads off at the organization for not taking the smallish wide receiver at 47. There was even thoughts that the Washington Redskins might take Jackson along with previously selected Devin Thomas to give them one of the best young wide receiving corps in the league. Fortunately for the Eagles, Jackson fell to them and they decided to select him at 49. In only two years, Jackson has become a star in the NFL. He has earned a Pro Bowl appearance. Furthermore, he has recorded 125 receptions for 2,079 yards and 11 touchdowns. Besides being a receiver, he is an excellent punt returner. He has taken three punts to the house, has amassed 881 yards and an 11.2 average per punt. Jackson is emerging as one of the best young talents in the game today. In one of the best draft classes in Reid’s era, he found a solid corner out of South Carolina. 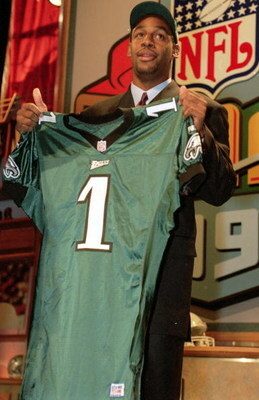 At the time Brown was selected, the Eagles had Troy Vincent and Bobby Taylor so many fans did not understand the reason why the team would take Sheppard and Brown. Either way, Brown became a fan favorite before his departure to the Cleveland Browns. The most memorable plays in Browns’ career came in the 2007 divisional playoff game against the Saints and the season opener in 2008 versus the Rams. In both games, he lit up running backs Reggie Bush and Steven Jackson. However, besides those two jaw-dropping hits, Brown had a very solid career with the Eagles. In eight seasons with the team, Brown played in 128 straight games, had 19 interceptions (three returned for touchdowns), six forced fumbles and 433 tackles. In just three short seasons, Stewart Bradley has seen his stock rise to new heights. Of course, Bradley missed the entire 2009 season, but before his knee injury, he was on his way to being the next elite middle linebacker in the league. In his second full season, Bradley anchored the middle for the Eagles and improved a good defense into a great defense. The Eagles soared all the way to the third ranked defense in the entire NFL. He finished the year with 128 tackles, one forced fumble, one sack and one interception. While those numbers are not mind-boggling, Bradley received high praise from his teammates and the media. SI’s Peter King put him on his All Pro team and teammate Brian Dawkins said he was a star in the making. Expect Bradley to pick up where he left off this upcoming season. Even though he had an injury-plagued career with the Eagles, he just kept coming back and being productive. Before his first torn ACL in the offseason of his second year, he was on his way to becoming a good back. Unfortunately, he blew out his knee and had to work hard to comeback from the major set back. Then two years later, Buckhalter blew out his knee again. His second torn ACL did not stop him as he worked his way back onto the field. Over his seven-year career in Philadelphia, he only played in five seasons, but when he was on the field he was highly productive. He racked up 2,155 rushing yards, 930 receiving yards and a combined 22 touchdowns. If Buckhalter did not suffer two brutal injuries, his numbers might be far more impressive and Westbrook possibly would never put up the numbers that he did over his career. In his rookie season, Todd Herremans was asked to step in for Tra Thomas as the starter at left tackle against a New York Giants team with Mike Strahan. Needless to say, Herremans held his own and since then he has become a mainstay on the Eagles offensive line. Herremans is currently the Eagles starting left guard, but his versatility has allowed him to shift over to left tackle or right tackle when an injury occurs on the line. On top of that, Herremans scored a touchdown in 2008 against the Seattle Seahawks. Ultimately, he has become a very good starter for Reid, but was virtually unknown coming into the draft out of Saginaw Valley State. In just five years, the former fifth round pick out of Cincinnati has become one of the best all-around defensive ends in the NFL. Trent Cole is the type of player that offensive coordinators have to game plan around because he brings such a high motor to the field. Additionally, Cole has recorded 47 sacks over his career at right defensive end. That is an average of 9.4 sacks per season. While that does not seem like much, he has done it with guys like Juqua Parker, Victor Abiamiri and an aging Darren Howard playing left defensive end. On top of all that, he is great against the run as well and has created 10 forced fumbles. When all is said and done, Cole might be one of the best defensive ends of his generation. At the end of his career, if Brent Celek avoids injuries, he could possibly make an argument for the best fifth-round pick in Eagles history. Initially, the Eagles drafted Celek to be a backup tight end and because he possessed the long-snapping skills. However, during the 2009 playoffs, Celek arrived on the NFL scene as a receiving threat by pulling in four touchdowns in just three games. In his first full year as the starting tight end, Celek registered career-highs with 76 receptions for 971 and eight touchdowns. This offseason, Celek has appeared to take the torch from McNabb and has become the team’s vocal leader. He is only 25 and has already made fans forget about LJ “Stonehands” Smith. Every Eagles fans knows just how important a good blocking fullback is to an offense, especially on third and short. In four seasons with the club, Cecil Martin started 38 games, which is a good accomplishment for a sixth-round pick. Furthermore, as the lead-blocker for Duce Staley, he helped him amass a career best 1,273 rushing yards. Even thought Jeremy Bridges never played in an actual game for the Eagles, he still was one of the best decisions in Reid tenure. The former sixth round pick has played seven seasons in the NFL, participated in 78 games and started 43. Of course, none were with Philadelphia, but he is the only other sixth round pick that has amounted to anything in the NFL. As a rookie, Moise Fokou cracked the Eagles starting lineup, which is amazing for a player that was just 26 picks away from being undrafted. In four starts as a rookie, he registered 16 tackles. More importantly, he heads into the 2010 season as the starting strong-side linebacker for the Eagles. If Fokou keeps progressing like coaches think, he could be one of the best steals in the 2009 draft. In his first two years in the NFL, Adrien Clarke played in 14 games, but started four at the guard position for the Eagles. In 2007, he signed with the New York Jets and started 14 games at left guard. I second it being a great list. I wish the Eagles would have a little more success in the first round, those are the guys that cost your team a bunch of money for years no matter what. Some really nice picks at the end of the draft which if you ask me is a sign of solid strategy and talent evaluation. IF YOU THINK ABOUT IT THE FIRST ROUND PICKS WE BEEN MISSIN ON DIDN`T REALLY COST THAT MUCH CAUSE WE WERE ALWAYS A PLAYOFF TEAM OR CLOSE AND THE 1ST RD. PICK WASN`T THAT HIGH. 62 wins - 0 Losses in the 2009-10 NBA Season! Sports Handicapper genius made $185,819 in March 2010 alone with his sport picks. How does he do it? This guys story is simply unbelievable 'John' wins an astounding 97% of his NBA & MLB sports bets consistantly, avergaing $70,000 every week! You have to See This! If you mention Bridges in the 6th, despite never playing a game for the Eagles; isn't the gold standard in the 7th Raheem Brock? Brock never signed with the team. At least they came to terms with Bridges. Brock refused to sign because he claimed the Eagles were lowballing him.